The Australian green tree frog (green tree frog in Australia, White's tree frog, or dumpy tree frog), Litoria caerulea, is a species of tree frogs. They live in Australia and New Guinea. The green tree frog was imported onto ships to the United States and New Zealand. The species belongs to the genus Litoria. The species magnificent tree frog (Litoria splendida) and the giant tree frog (Litoria infrafrenata) are similar to the green tree frog. The green tree frog is the largest frog in Australia. It can reach to 10 centimeters (4 inches) in length. The average lifespan is about sixteen years, if kept captive. Green tree frogs are easy to take care of. They are okay with living near human buildings. They are often found on windows or inside houses. The green tree frog screams when it is in danger. It does this to scare off animals that have threatened them. The green tree frog squeaks when it is touched. The green tree frog is known as the most recognizable frog in Australia. This is because of how the frog looks like and because of its behavior in its habitat. It is also a popular exotic pet throughout the world. The frog's skin has antibacterial and antiviral protections. Their skin may be useful for medication in treating patients in the future. The green tree frog is one of many tree frog species of the genus Litoria. They are native in Australasia. The common name of the species is "White's tree frog". The species were named after John White. He first discovered the species in 1790. 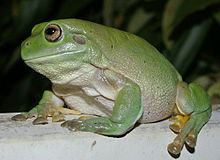 The green tree frog was the first frog to be classified in Australia. The specimen of the green tree frog was collected by Sir Joseph Banks. It was destroyed during the German bombing of the Hunterian Museum during World War II. The museum was located at the Royal College of Surgeons in London. The green tree frog was first called the "blue frog" (Rana caerulea). The original specimens White sent to England were damaged by the preservative and looked blue. The color of the frog is caused by blue and green pigments covered in a yellow layer. The preservative destroyed the yellow layer. It left the frog looking blue. The word caeruela, which means blue in Latin, is part of the green tree frog's scientific name. The frog is also more known as the "green tree frog". However, that name is often given to the larger green tree frog (Hyla cinerea) in its region. The green tree frog can reach 10 centimeters (4 inches) in length. The frog's color depends on the temperature and the color of its environment. The green tree frog can be brown or green. The frog's mouth is white. The frog may have small, white-shaped spots on its back. At the end of its toes, it has large discs. This gives the frog the ability to climb. The eyes are golden. The fingers of the frog have webbed feet for swimming. The tympanum membrane can be seen on the frog. The green tree frog looks similar to the magnificent tree frog (Litoria spendida). This frog is native to north-western Australia. The magnificent tree frog has large patrotoid and rostral glands on the head. The giant tree frog (Litoria infrafrenata) is also sometimes confused with the green tree frog. The giant tree frog has white stripes. These stripes are on the edge of the frog's lower jaw. The green tree frog does not have these stripes. The appearance of the green tree frog tadpole changes during its development. The tadpole can reach from 8.1 millimeters (after it has hatched) to 44 millimeters. The tadpole is brown, but it later changes to green during its development. The underside of the tadpole is dark. It changes to white when the tadpole is an adult frog. The eggs are brown, in a clear jelly. They are 1.1–1.4 millimeters in diameter. The green tree frog has lungs. They absorb oxygen through their skin. For this to happen, their skin has to be moist. However, their skin can get infected by pathogens. Pathogens will live on the frog's skin. This makes them sick. The frog will then grow peptides. These will destroy the pathogens. The skin of the Green Tree Frog has caerins. Caerins is a group of peptides with antibacterial and antivirial protection. It also has caerulins. The caerulins have physiological effects. The CCK-8 is a digestive hormone and hunger suppressant. Several peptides from the skin of the green tree frog have been found to destroy HIV without harming healthy T-cells. The green tree frog is native to northern and eastern parts of Australia. They are also native to southern New Guinea. In New Guinea, the green tree frog lives in the drier area of the country. The frog can be found from Irian Jaya to Port Moresby. It also can be found on Daru Island. There has been records of the frog found in northern New Guinea. However, it is thought that they were introduced there by humans. The International Conservation Union (IUCN) believes the frog is in "scattered locations" in both New Guinea and Indonesia. The species has been introduced to the United States and New Zealand. The frog can be found in the US state of Florida. It is believed that they were introduced through pet trade. There are only small populations in Florida. It is unknown if they have caused any ecological damage. In New Zealand, there were large populations of the green tree frog. However, there have been no sightings since the 1950s. Green Tree Frogs are easy to take care of. They are active at night. During the day, they will rest near a place where it is cool, dark, and moist. In the winter, green tree frogs do not make calling sounds. They are also not seen that much. Depending on their location, green tree frogs will live in several habitats. They are found in the canopy of trees. They are also found near slow-moving waters. They can also live in swamps or in the grasslands in cooler climates. green tree frogs are known to live inside houses. They can be found in sinks and toilets. They can also be found on windows. They will also live in tanks, downpipes, and gutters. They like living in those places because they provide high humidity. The habitats can also be cooler than their environment. The frogs will be near downpipes and tanks during mating season. They do this because the tools will make their call louder. The species' call is a low, slow Brawk-Brawk-Brawk. They repeat it many times. For most of the year, they will call while being on top of something that is very high. These include trees and gutters. During mating season, the frogs will call near a place where there is water. They will stay there for a little while or forever. Like many frogs, green tree frogs call to attract a mate. They will also use their call to warn other frogs that they are near. The green tree frog will make a stress call whenever they are in danger. The green tree frogs will eat insects and spiders. However, they can also eat smaller frogs and even small mammals. The frog's teeth are not made for cutting up their prey. This means that the prey has to fit inside their mouths in order for the frog to eat it. Many frogs will stick out their tongues at prey. The green tree frog's tongues, as with many frogs, are very sticky. The prey will be stuck and will be eaten. The green tree frog will use their tongues on small prey. For larger prey, they will jump on top of it and force it into their mouths using their hands. The frog has a few predators. They include snakes, a few species of lizards and birds. Dogs and cats have also been known to catch and eat Green Tree Frogs. The green tree frog can live up to sixteen years, if kept captive. But some have been known to live for over twenty years. The average life expectancy in the wild is lower than being captive. This is because of predation. The green tree frog is one of the most popular pet frogs in the world. This is because of its submissive behavior and long life expectancy. It is also a popular pet frog because it looks like a cartoon frog. It is also one of the easiest frogs to take care of. Their diet are not expensive. They also have a strong resistance to diseases. Overfeeding the frog is a common problem with pet owners. The green tree frog tends to become obese when it is overfed. In the wild, the frog's energy is needed for the frog to catch its prey. However, in captivity, they are given live food. They are also housed in comfortable habitats. This makes the frog lazy because it does not have to do any activities. When the frog is inactive, it will gain weight. An overweight green tree frog will have fat layers on top of the head and body. This gives it a "dumpy" look. This is why some pet owners call the green tree frog the "dumpy tree frog". Litoria caerulea in Darwin, Northern Territory. According to the Environment Protection and Biodiversity Conservation Act 1999, the green tree frog is protected in Australia. The IUCN lists the frog as "least concern". It is listed as "least concern" because the green tree frog can be found in many places. The Green Tree Frog's population is not declining. Some of the green tree frog's natural habitats have been destroyed. Some Green Tree Frogs have been found to be infected with chytrid fungus. This causes chytridiomycosis. The population of the green tree frog in Australia is declining. However, because of the long life expectancy of this species, it will take longer for the frog to be an endangered species. ↑ Egerton 2005, pp. 379-388. ↑ 3.0 3.1 3.2 3.3 3.4 3.5 Egerton 2005, p. 383. ↑ Tyler, Michael J; Davies, Margaret (1994). "Family Hylidae" (PDF). Fauna of Australia. Department of the Environment, Water, Heritage and the Arts, Australia. Retrieved 2007-12-11. ↑ "White's tree frog (Litoria caerulea)". The Children's Museum, Hartford, Connecticut. Retrieved 2007-12-11. ↑ 6.0 6.1 6.2 6.3 6.4 6.5 6.6 6.7 6.8 Vincent, L. (2001). 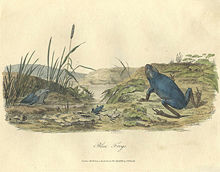 "Litoria caerulea" (PDF). James Cook University. Retrieved 2005-06-12. ↑ 7.0 7.1 7.2 "Litoria caerulea". Frogs Australia. Frogs Australia Network. Retrieved 19 June 2012. ↑ 8.0 8.1 8.2 8.3 8.4 8.5 8.6 "Fact Sheet: White's tree frog". National Zoological Park. Smithsonian. Retrieved 2005-12-12. ↑ Brunin, Tami. "Australian Green Tree Frog Profile". Animal Diversity. Interagency Education Research Initiative. Retrieved 19 June 2012. ↑ Salmon, AL; et al. (2000). "Isolation, Structural Characterization, and Bio activity of a Novel Neuromedin U Analog from the defensive skin secretion of the Australasian tree frog, Litoria caerulea". Journal of Biological Chemistry 275 (7): 4549–54. doi:10.1074/jbc.275.7.4549. PMID 10671478. http://www.jbc.org/cgi/content/full/275/7/4549. ↑ "Frog secretions block HIV". Vanderbilt University. Retrieved 2005-12-12. ↑ "Litoria caerulea (White, 1790)". Nonindigenous Aquatic Species. U.S. Geological Survey. June 2002. Retrieved 2007-12-11. ↑ "Introduced frogs". New Zealand Frog Research Group. 2006. Retrieved 2007-12-11. ↑ "Environment Protection and Biodiversity Conservation Act 1999". Australian Government. Retrieved 2005-12-12. Wikimedia Commons has media related to Litoria caerulea. Wikispecies has information on: Litoria caerulea. This page was last changed on 11 January 2019, at 01:26.